CBS' Bob Schieffer Retires Sunday As Last Of The Old-School TV Anchors : The Two-Way Bob Schieffer, anchor of CBS' Face the Nation, retires Sunday after 46 years at the network. NPR TV Critic Eric Deggans says Schieffer is the last among a vanished breed of traditional news anchors. Bob Schieffer on the set of Face the Nation in September. 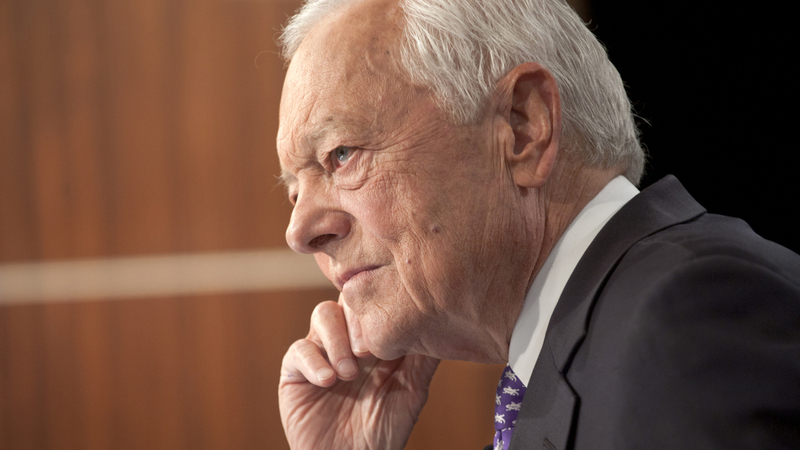 No one can ask a tough question quite like Bob Schieffer. For example, when he asked then-presidential candidate John Edwards: "It appears that the White House strategy will be to picture you as a pretty boy....A lightweight...Does that bother you?" Cue nervous laughter from a candidate who became known for paying $400 to get a haircut. 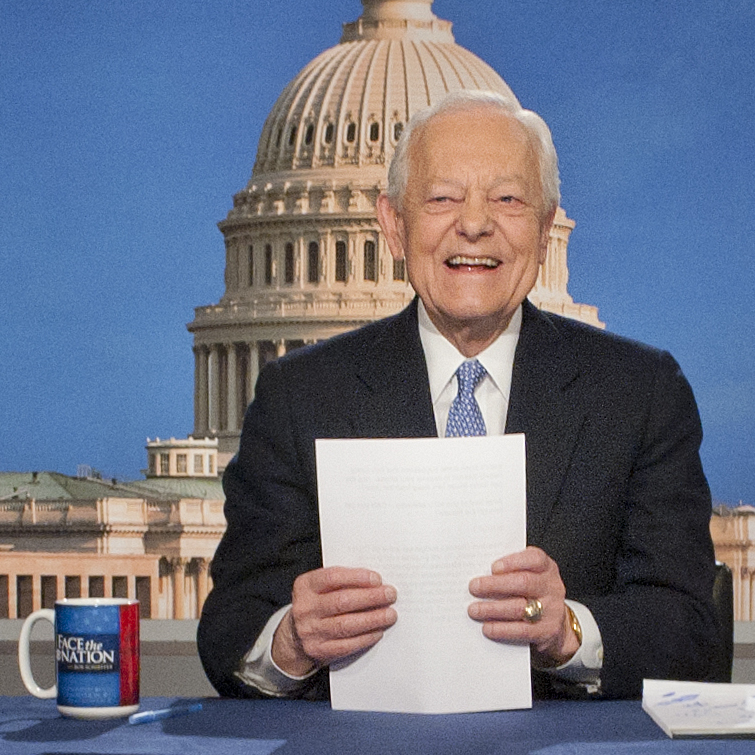 Bob Schieffer, shown here in 2013 on the set of Face the Nation, a show he hosted for 24 years. Or when Schieffer queried U.S. Sen. Ted Cruz about the 2013 government shutdown, asking: "You became a celebrity when you led the drive to shut down the government over Obamacare. But afterward, your fellow Republicans said you'd led them over a cliff." When Cruz responded by insisting he hadn't shut down the government, the Obama administration did, Schieffer answered with a knowing laugh that spoke volumes. Schieffer's unique style — equal parts folksy inquisitor and experienced political insider — has become a signature of CBS' Face the Nation. Which makes his departure Sunday after 24 years a pivotal event. In fact, his retirement means one of the most experienced voices in Washington journalism will soon leave the airwaves (CBS News political director John Dickerson will take his place as host). Schieffer also retires as a lynchpin at CBS News, where he has worked for 46 years — the last of the old school anchors from the heyday of network TV news. Now age 78, Schieffer has promised to retire many times before; he told me back in 2006 that he would retire at age 70. But, as he recently told WAMU's Diane Rehm, now that CBS News seems to be in a stable place, he's really ready to leave. "I wanted to go when people thought I could still do the job," he said, drawing a laugh from Rehm. "You know, I've seen too many of these people on Capitol Hill, they sort of have to be led out by the hand. And I just didn't want to be one of those." Schieffer leaves CBS with impressive stats. He's one of the few reporters to have covered the White House, Congress, the State Department and the Pentagon. He's interviewed every president since Richard Nixon and moderated three presidential debates. But his reporting career began at the Fort Worth Star-Telegram newspaper in the mid-1960s. Schieffer told NPR's Bob Edwards back in 2003 about his first big story; when he spoke to Lee Harvey Oswald's mother not long after President Kennedy was killed. "I had literally walked into the office, picked up a phone and a woman said, 'Is there anybody there who can give me a ride to Dallas?'" he noted. "I said, 'Lady, the president has been shot.' And she says, 'Yes I heard it on the radio. My son is the one that they have arrested.'" Schieffer took her to Dallas and got the scoop for his paper. Schieffer began working at CBS News in 1969, anchoring the weekend newscasts from the mid-70s to the mid-90s. He took over Face the Nation in 1991. But it wasn't until years later that the anchor got what may have been his most important assignment for CBS News: succeeding Dan Rather at the CBS Evening News. In 1980, Schieffer lost out to Rather for the top anchor job at CBS after Walter Cronkite retired. But he was pressed into service in 2005, when a controversial story about President George W. Bush's National Guard service led to Rather's ouster at the network. The resulting controversy rocked CBS News, but Schieffer became a steadying hand at the Evening News, focusing the broadcast on hard news and its experienced correspondents. His style increased ratings while reinforcing CBS' legacy as a traditional news network; an approach the news department continues today. Now Schieffer leaves the anchor chair as one of the last links to the days of CBS stars like Cronkite — an influential anchor distinguished by his roots in traditional reporting and old school journalism.